After Delhi, Mumbai and Bengaluru, it's now at Chennai. Only a few weeks since it opened, the place is full up and the waiting list to dine there grows longer. Walk into the restaurant and what hits you is how colourful it is. Prints of Manga graphics are present everywhere - on the walls and even on the ceiling (they're on sale, by the way). This then is Mamagoto, translated as play with food. 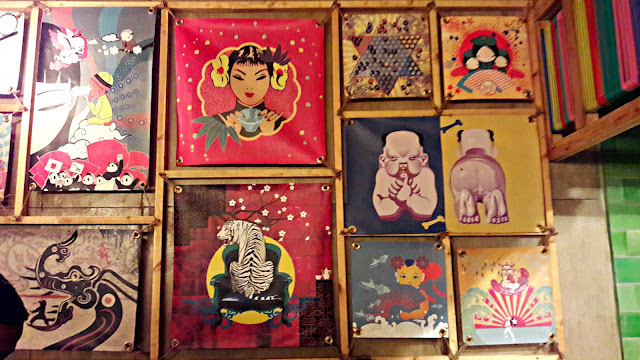 It's a casual, quirky dining place, the music is lively and you just need to go with the flow. 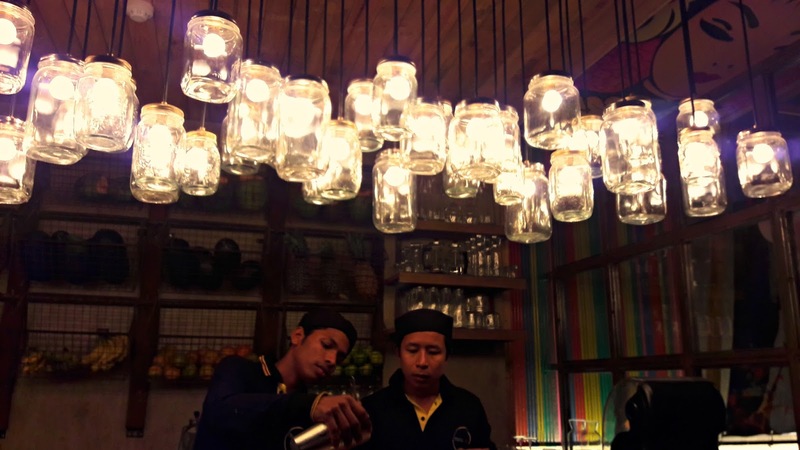 Lighted glass jars hang over the bar counter but they don't serve alcohol as yet. However they do have detox drinks and interesting mocktails. The Chennai restaurant is the first in the chain to have a teppan grill. Which is where we are seated and have a ring side view of the action. The energy at Mamagoto is amazing. The service crew is busy, explaining the menu, making suggestions. 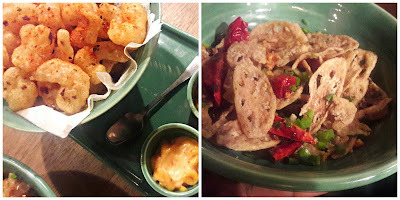 Much as I love Asian food, I'm quite lost when deciding what to order from the vast pan-Asian menu which offers soups, salads, wok fries, robata, teppan, signature bowls... phew!! My niece is a seasonal vegetarian so she helps to review the vegetarian side of the tasting session. She loves her virgin sangria and I love my cold, tart and refreshing kiwi and mint Collins. They bring her 3 varieties of veg dumplings - traditional Peking, old school gyoza and street style spicy dumpling. Unless you investigate the flavours, it's only the toppings that differentiate them. I particularly liked the gyoza with the crisp pan fried base with bean 'sambal' over the top. The chunky fillings are tasty; my only issue is that the skins are green, they are tinted with spinach juices they hasten to reassure us. The teppan in front of us is heated and we see the chef making sticky fried rice. Fine diced vegetables sizzle on the hot metal sheet, beaten eggs are poured onto another part of the plate and then fat grains of rice, seasonings, the egg and greens are tossed together before being dished up into a bowl and served piping hot. I love that sticky rice is used, that's the best kind for fried rice. Small plates on the menu translate to starters. We order hot basil chicken cups and luckily they make us a tasting portion. The cups are iceberg lettuce leaves that have gone a trifle flat but they are filled with coarse minced chicken and birds' eye chilli. Yum!! Spicy!! There's rock shrimp tempura with a spicy mayo. The prawns are medium sized, the coating is delightfully crunchy but the prawns lack flavour. The mayo does help a lot. Crispy lotus stem with burnt garlic and dried red chilli does live up to its name. 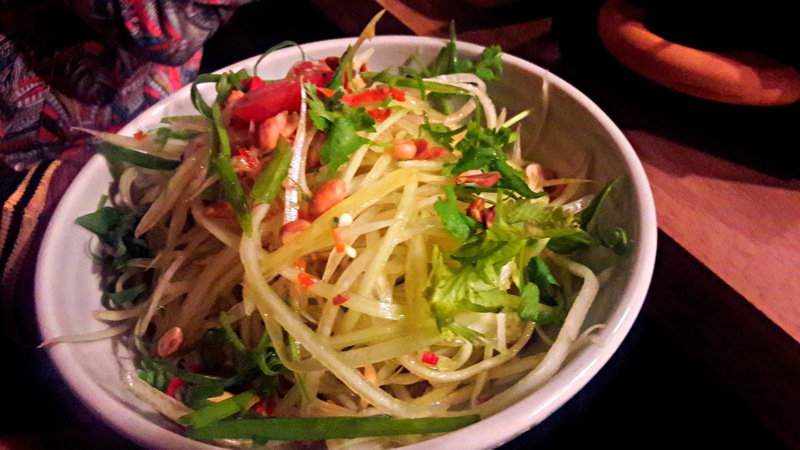 The lotus stems are fried to a crisp and again, you need to eat them with one of the dips. I found the son tham - raw papaya salad, missing its characteristic punch of acidity and the all important fish sauce. We were told that we could ask for it to be seasoned with nam pla if we so desired. That's good to know, right? Crushed peanut is the traditional topping but here, they were left whole.We're told that they would have loved to have served us the snow pea and green bean salad but snow peas were not available in the Chennai markets so have asked for them to be sent in from Bangalore... I'm really beginning to love this restaurant! My niece gets a half portion of veg sticky fried rice, steamed rice and Thai red curry with veg. She loves them, particularly the red curry which is delicious. The steamed rice is a tad dry but everything else is perfect. Mama doesn't like doing half portions of any of their dishes as it interferes with their recipe procedure but they were kind to us that night. 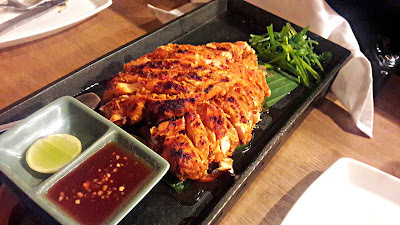 They bring me a spiced Asian BBQ chicken breast. The portion is really large, the meat is sliced for easy service. 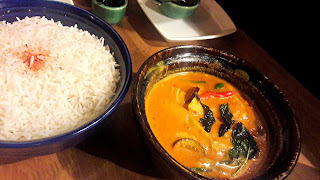 I love the flavour of kaffir lime leaf and the bursts of chilli in the spice paste and would have gone into raptures over the dish if it were a little more tangy. I like that each of these dishes comes with an accompanying dip. 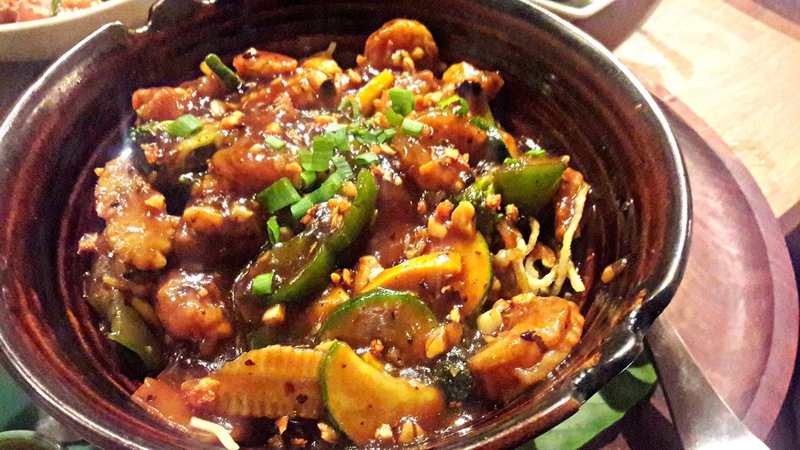 The chicken version of sticky fried rice is served with sliced chicken in black bean sauce. 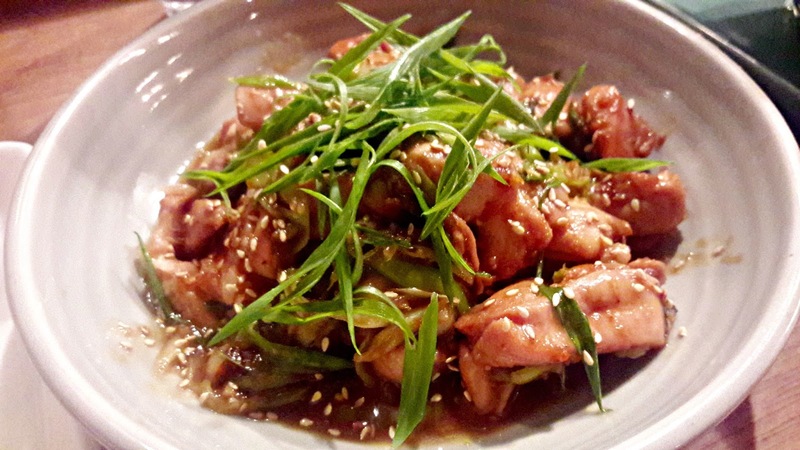 The rice is flavoured with sesame oil and the chicken is beautifully tender and has a little heat coming from ginger juices. Absolutely delicious. Soho pan fried noodles and we opted for a version with prawns. I'm quite a traditionalist as to what goes into my noodles - bean sprouts and greens but in this bowl, I could see baby corn, broccoli, peppers and zucchini. But everything was soon forgiven - that black bean sauce that the juicy prawns and veg had been tossed in had a slightly smokey flavour and was absolutely delish. Mamagoto wouldn't let us go without tasting their most popular desserts. The eggless banofee pie I was told, is lip smacking. The vanilla cake with its to-die-for toffee sauce was divine but the let down was the coconut ice cream with palm sugar. No colour nor flavour of palm sugar and the taste of coconut was too strong. A meal for 2 at Mamagoto should work out to around 1200/-. Mamagoto is at 9, Khader Nawaz Khan Road, off Nungambakkam Road, Chennai 34. Call 044 33999610 for reservations.